Fall is an excellent time to control perennials and winter annuals, but a few key management steps can greatly improve the results. This quiz hits on a few highlights. Crop rotation and seed decisions are improved when growers and agronomists have a good handle on the disease situation. Blackleg levels were higher than expected in some areas this year, and clubroot continues to spread. Knowledge of the incidence and severity of these two diseases provides an important head start in keeping them under control. 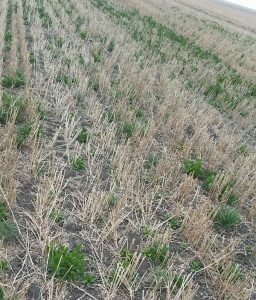 The first step in canola volunteer management is to do nothing. Leaving seeds undisturbed so they germinate in the fall or get eaten by birds and insects is a good way to reduce the volunteer seedbank. Canola seeds that remain on the soil surface when the snow flies will deteriorate over the winter. 1. Wait for post-harvest regrowth. 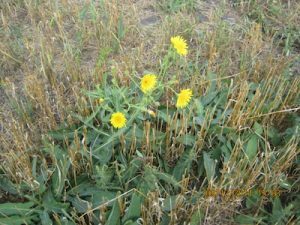 Weed management includes a keen eye for the unusual. 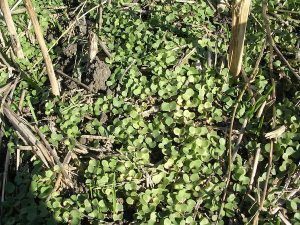 “Unusual” can be suspicious patches of common weeds (herbicide resistance?) and presence of new unknown weeds. Jimsonweed is, for many, an usual and unknown weed. (Shown above.) It was reported in several Alberta canola fields a couple weeks ago, and has now been confirmed in fields in 11 Alberta municipalities. After a drought-stressed summer in many areas of the Prairies, canola plants may have a lingering hormone response that can cause seed sprouting (above) in the pods and regrowth of cut plants. 1. High green. Will it clear? 2. Frost in the forecast. Swath now or leave it standing? 5. How much canola does your combine throw over? 9. How much seed will you need for next year? Fall soil tests: Now or before freeze up? If you want to use soil test results to see whether this year’s crop had enough nutrients, sampling now would be the better option. To plan for next year, soil samples taken closer to freeze up are a more accurate estimate of levels next spring.